"Ryan Point and Marine Park, Washington"
Click image to enlarge Ryan Point, Washington, and the old Kaiser Shipyards. Tomahawk and Hayden Islands are in the background. Image taken October 9, 2006. 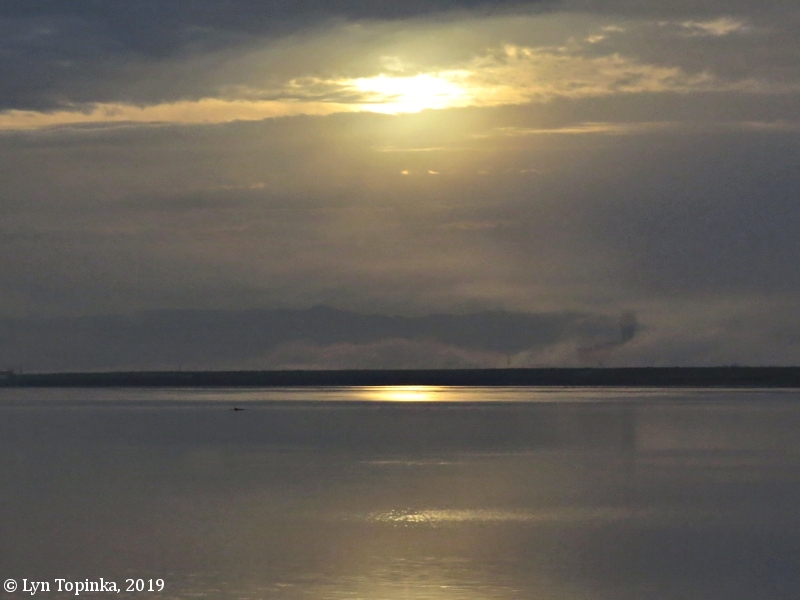 Today's Ryan Point is on the Washington State side of the Columbia River at River Mile (RM) 108, a little more than one mile upstream of the Interstate 5 Bridge. Upstream is Tidewater Cove and Wintler Park. 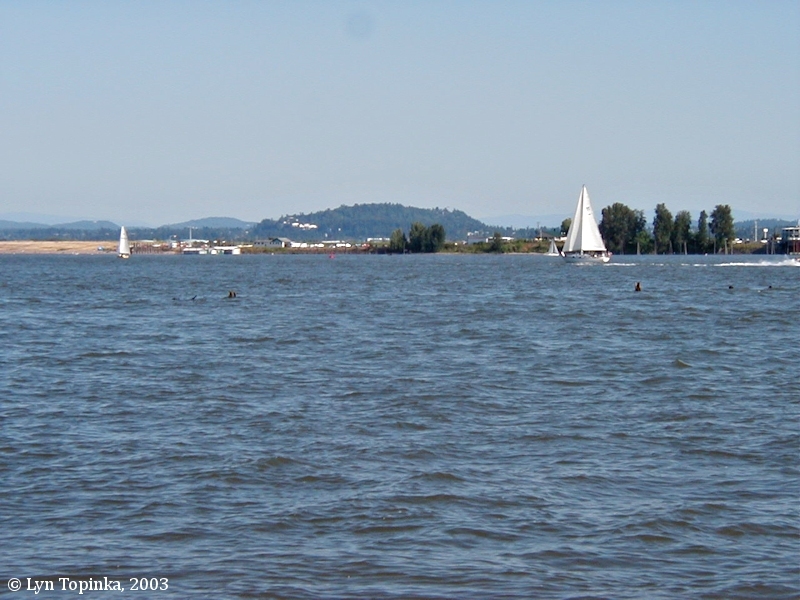 Downstream is Columbia Shores, Pearson Field, and Fort Vancouver. 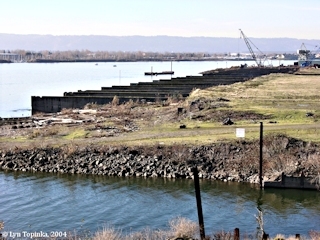 Ryan Point is the site of a former shipyard and is now an industrial park. The actual "point" is behind Building 33, a huge warehouse in Columbia Business Center, one of the largest industrial parks in the Vancouver-Portland area. 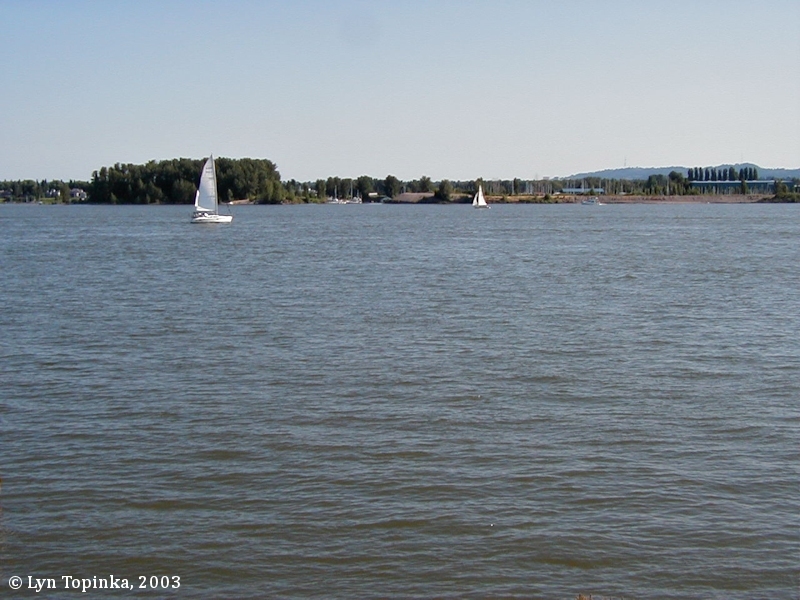 Lewis and Clark's March 30, 1806 campsite was located just downstream of Ryan Point, across from the center of today's Hayden Island, near the location of today's Fort Vancouver National Historic Site. This area would become known as "Jolie Prairie". 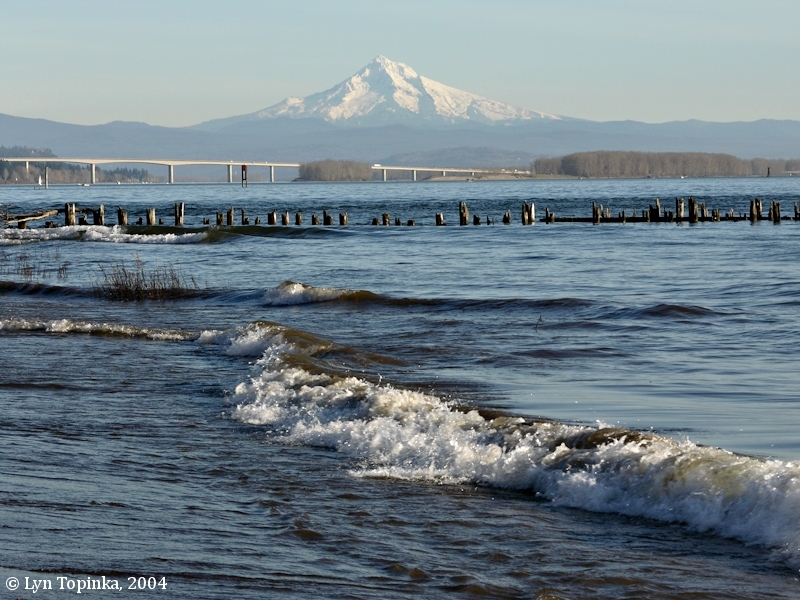 As the men approached the area they viewed Mount Hood and Mount St. Helens, and saw and named Mount Jefferson. 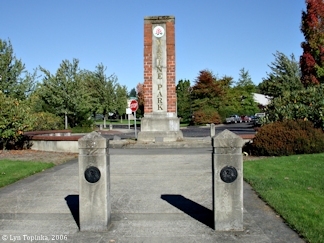 Ryan Point is named for William Ryan, an early sheriff and assessor in Clark County. The point was previously known as "McLoughlin Point" after Dr. John McLoughlin of the Hudson Bay Company. McLoughlin Point appears in the journal and on the maps of the Charles Wilkes Expedition, 1841. The name changed to Ryan Point sometime before the Hidden family, which still owns the riverfront property, bought the land in 1865. 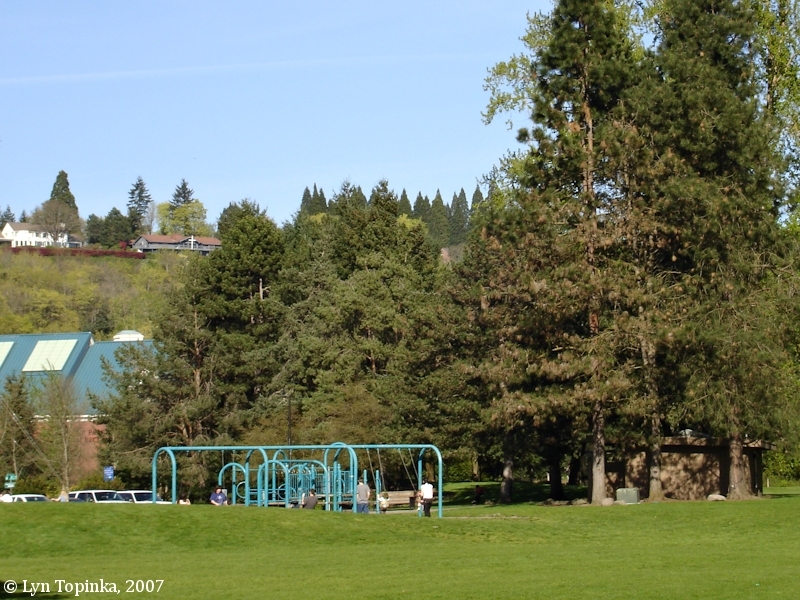 The 1850 Federal Census for the Clark County area of the Oregon Territory lists a "Wm. Ryan", age 36, farmer, born in Ireland, wife Susan, age 28, born in Kentucky, daughter Jane, age 9, born in Missouri, son James, age 7, born in Missouri, and daughter Susanna, age 2, born in Oregon Territory. An 1863 Washington Territory cadastral survey (tax survey) for T2N R1E shows Claim No.39, the property just east of the "Vancouver U.S. Military Reservation", belonging to William Ryan. The property included the point. The U.S. Bureau of Land Management's General Land Office Records (GLO) website (2006) shows title being granted to Sasannah Ryan and William Ryan for 633.3 acres of T2N R1E Sections 24, 25, 35, and 36, on December 11, 1879 (1850 Oregon-Donation Act). The U.S. Bureau of Land Management's General Land Office Records (GLO) website (2006) shows title being granted to Arthur W. Hidden for 164.65 acres of T2N R1E Section 22, on April 20, 1882 (1820 Sale-Cash Entry). 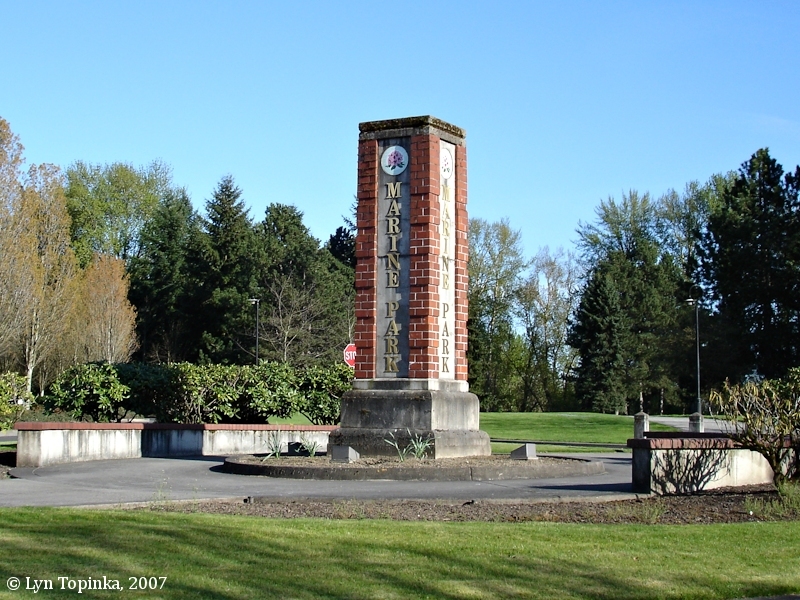 Entries for a "Lowell M. Hidden" are located to the north. An 1888 plat map for "Clarke County" shows the "W. Ryan D.L.C." being split into smaller homesteads, with "W. Ryan, Jr." owning the property west of the Point, and "L.M. Hidden" owning the Point and the property to the east. West of the "W. Ryan, Jr." property, yet still on the Ryan Donation Land Claim, is property owned by "J. Blurock", possibly the same Blurock of Blurock Landing. In 1914 the U.S. Board of Geographic Names made official the name "Ryan Point". 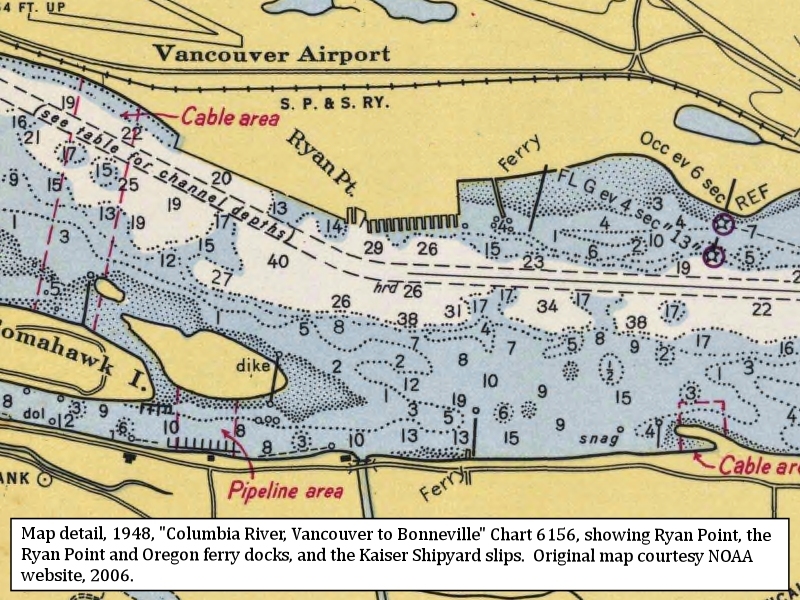 The 1948 NOAA Nautical Chart #6156, "Columbia River, Vancouver to Bonneville" shows a ferry landing at the location of today's Ryan Point boat ramp. Another ferry landing was across from Ryan Point on the Oregon side, just downstream of the west end of the Portland Airport, where NE33rd St. meets the Columbia River. 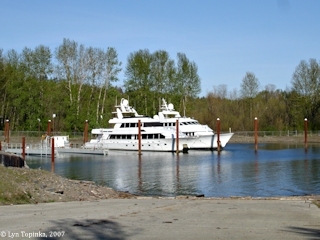 A marina exists there today. 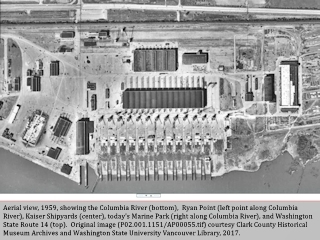 Click image to enlarge Map detail, 1948, showing Ryan Point, the Ryan Point and Oregon ferry docks, and the Kaiser Shipyard slips. 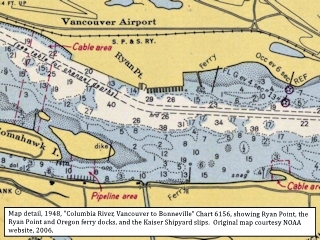 Historical Chart 5156, "Columbia River, Vancouver to Bonneville", 1:40,000, courtesy NOAA website, 2006. 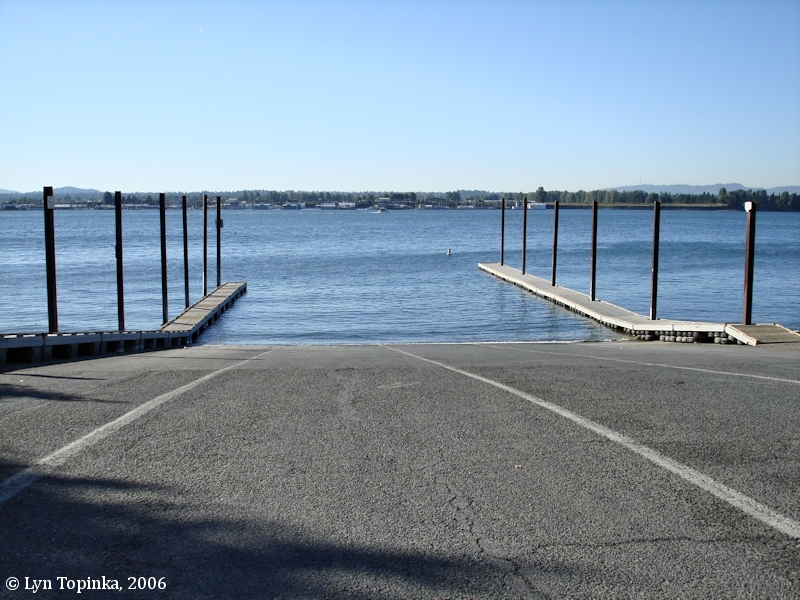 Click image to enlarge Boat dock/ramp/landing at Ryan Point, Washington, once the location of a ferry landing. View looking west. Image taken October 9, 2006. 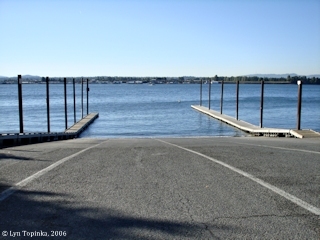 Click image to enlarge Boat dock/ramp/landing at Ryan Point, Washington, once the location of a ferry landing. View looking south. Image taken October 9, 2006. "During frenzied activity between 1942 and 1946, the yard built and sent off to war 141 vessels of several types, including aircraft carriers, Liberty ships, LSTs (landing ship, tanks) and transport and cargo ships." 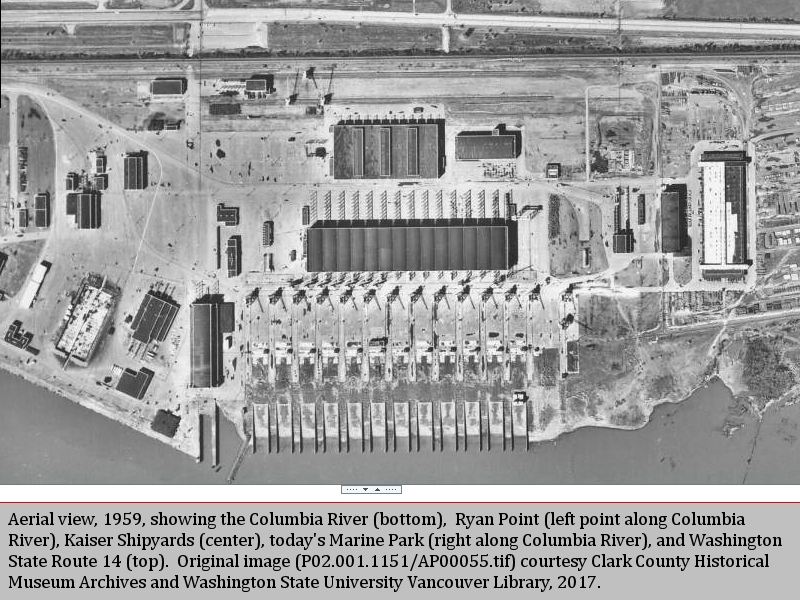 Click image to enlarge Detail, 1959, aerial photo, Ryan Point, Kaiser Shipyards, and Marine Park, Vancouver, Washington. 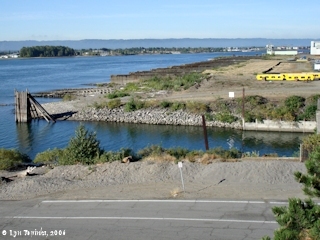 View showing Columbia River (bottom), Ryan Point (left point along Columbia River), Kaiser Shipyards (center), today's Marine Park (right along Columbia River), and Washington State Route 14 (top). Original image (P02.001.1151/AP00055.tif) courtesy Clark County Historical Museum Archives and Washington State University Vancouver Library, downloaded April 2017. 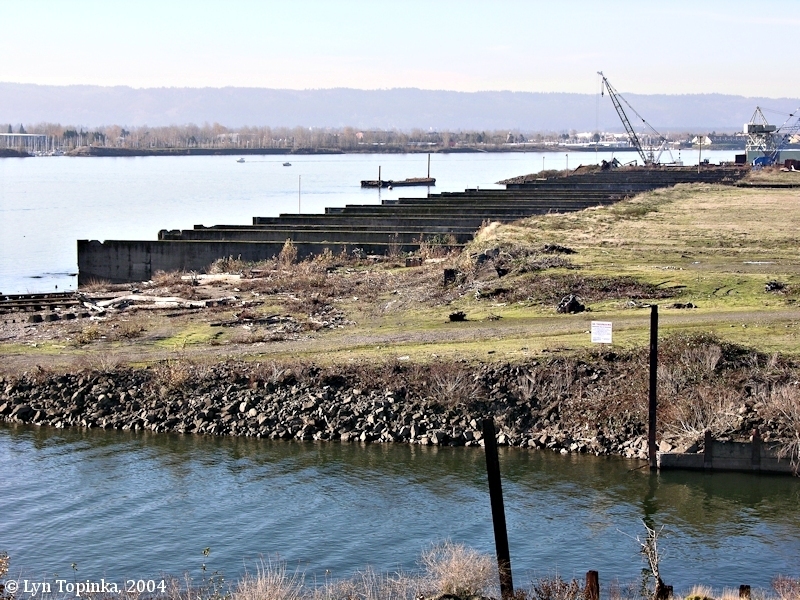 Click image to enlarge The old Kaiser Shipyard, from Ryan Point, Washington. Image taken December 18, 2004. 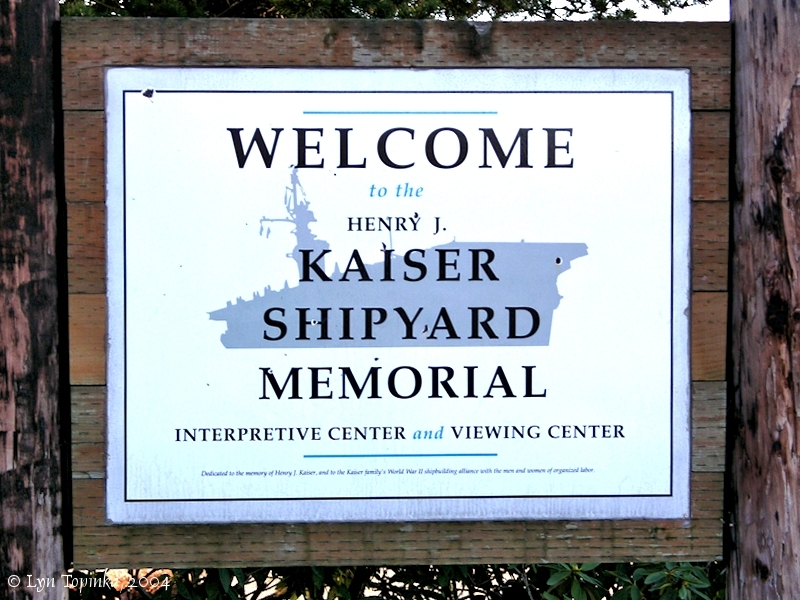 Click image to enlarge Kaiser Shipyard Memorial sign, Ryan Point, Vancouver, Washington. Image taken December 18, 2004. 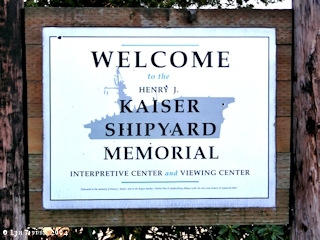 Click image to enlarge Kaiser Shipyard Memorial, Ryan Point, Vancouver, Washington. Image taken December 18, 2004. 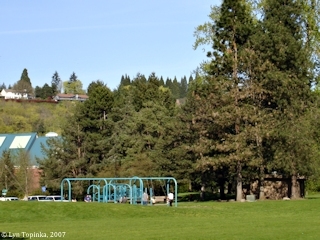 Marine Park is a 26-acre community park located at Ryan Point. 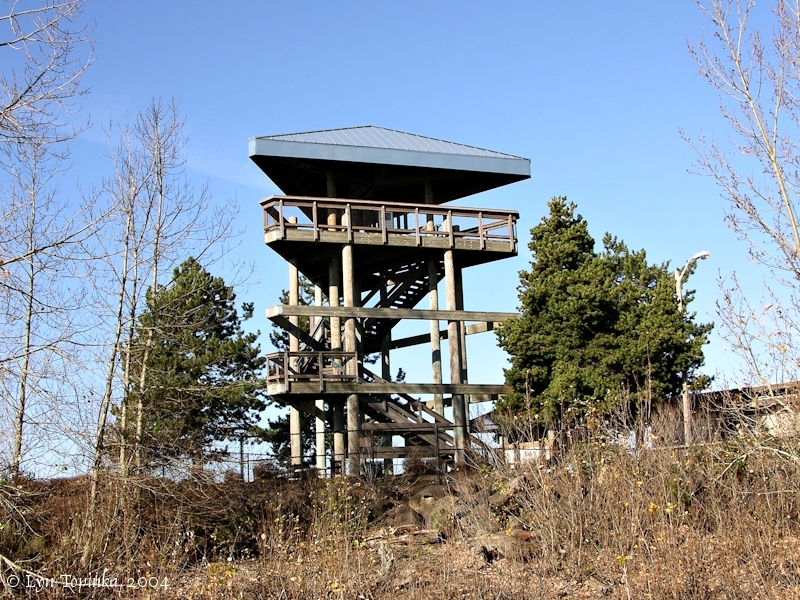 The park includes picnic tables, play equipment, a ball field, hiking trails, and a boat ramp. 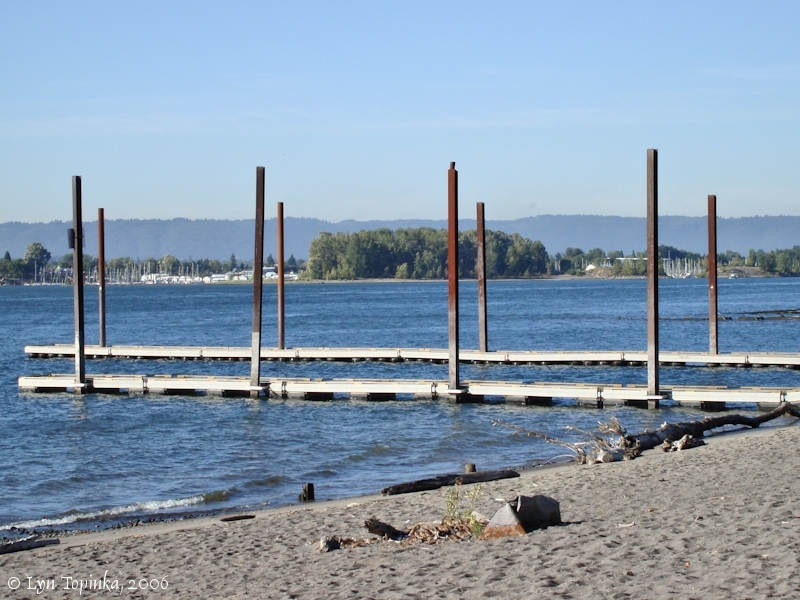 Marine Park lies along Vancouver's Waterfront Renaissance Trail. 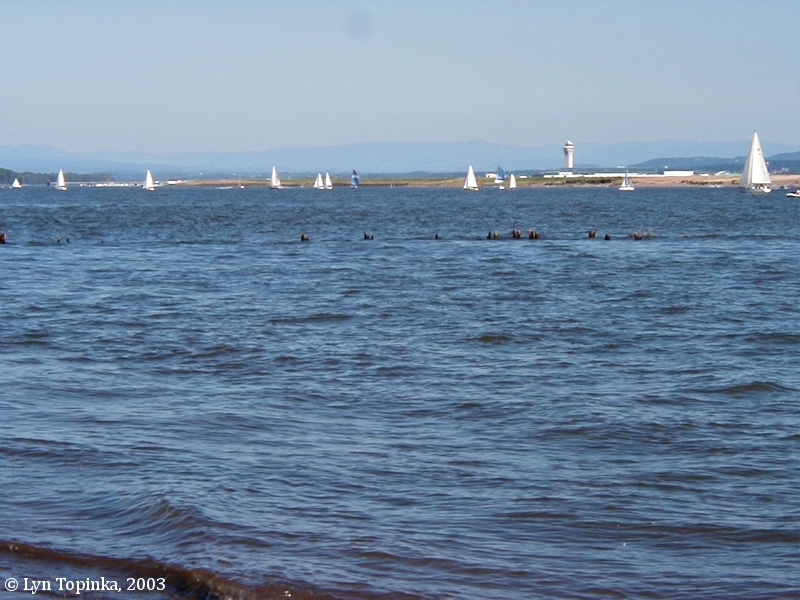 Click image to enlarge Obolisk, Marine Park, Vancouver, Washington. Image taken October 9, 2006. 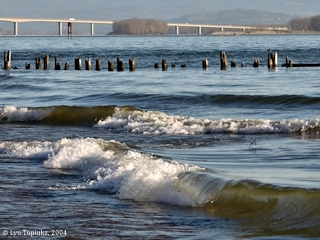 Click image to enlarge Obolisk, Marine Park, Vancouver, Washington. View at the entrance to Marine Park and Ryan Point. Image taken April 5, 2007. 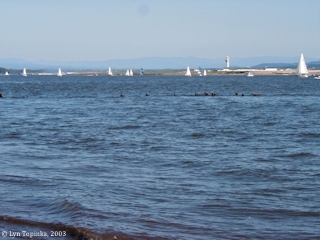 Click image to enlarge Marine Park, Vancouver, Washington. Image taken April 5, 2007. 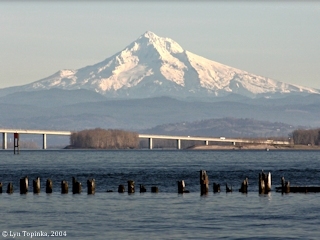 Click image to enlarge Mount Hood, Oregon, and the Interstate-205 Bridge, as seen from Ryan Point, Washington. Image taken December 18, 2004. 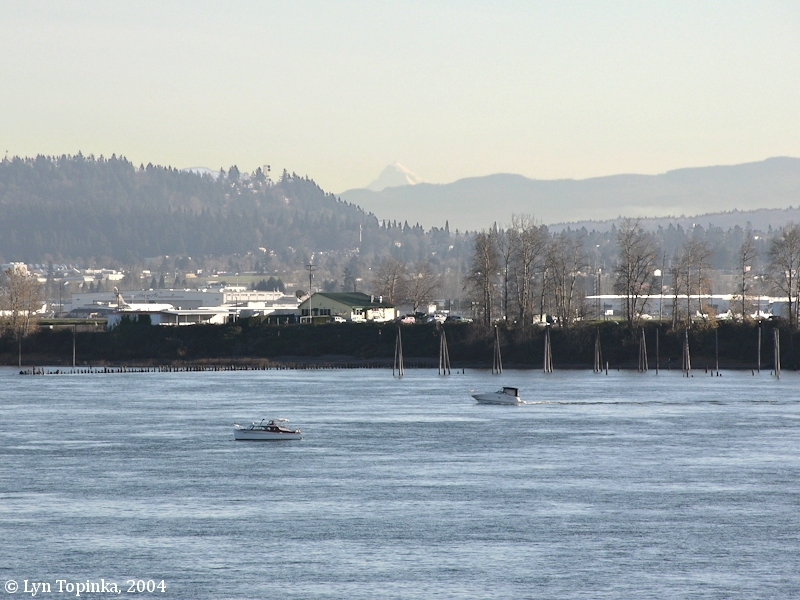 Click image to enlarge Mount Jefferson, Oregon, as seen from Ryan Point, Vancouver, Washington. Image taken December 18, 2004. 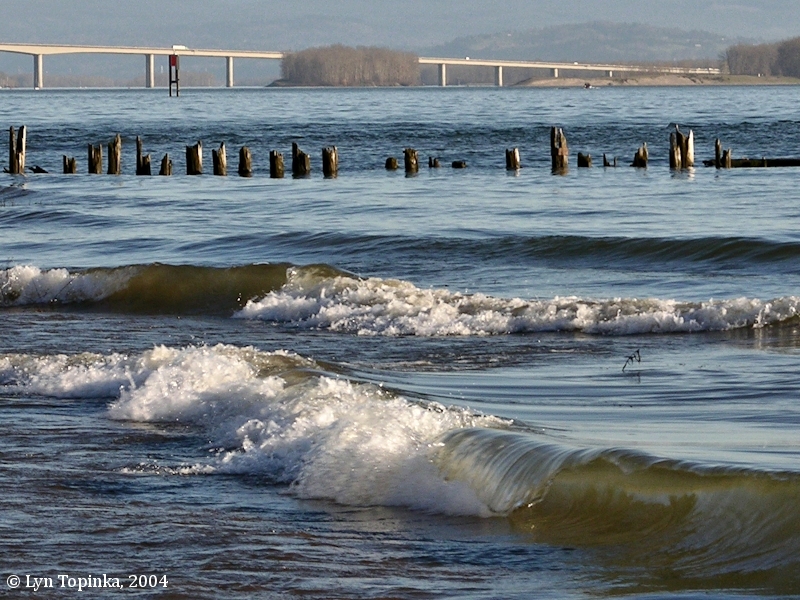 Click image to enlarge Cove east of Ryan Point, Vancouver, Washington. Cove east of Ryan Point. Image taken April 5, 2007. Click image to enlarge Sunrise, Columbia River from Marine Park, Ryan Point, Vancouver, Washington. Image taken January 5, 2019. 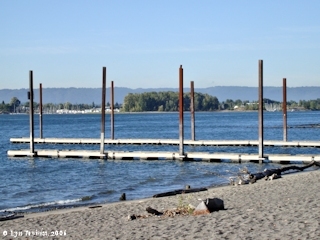 Ryan Point, Vancouver, Washington, offers wonderful views of the Columbia River. 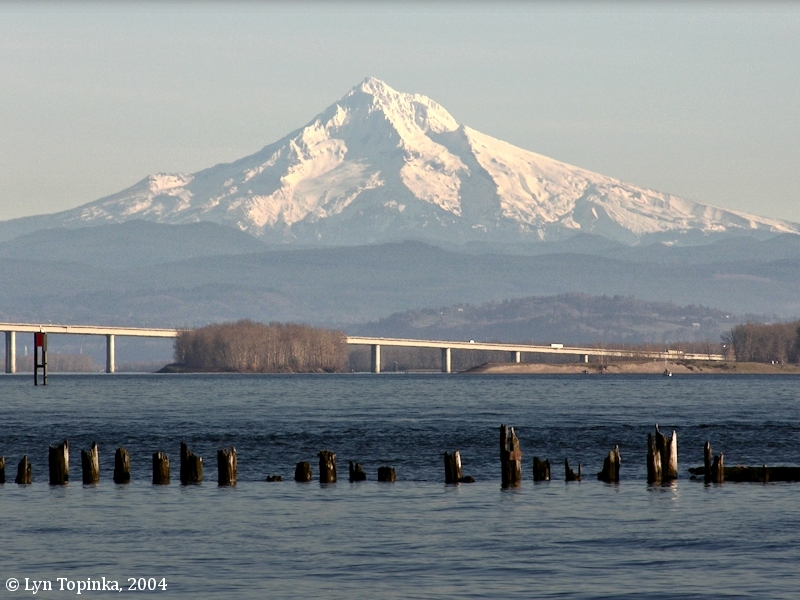 Upstream is Mount Hood, Oregon with the Interstate 205 Bridge in the foreground. 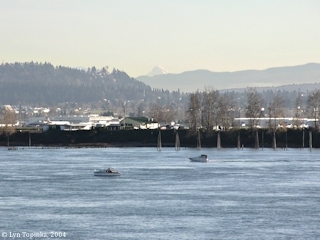 Portland International Airport and Rocky Butte can also be seen on the Oregon side of the Columbia. 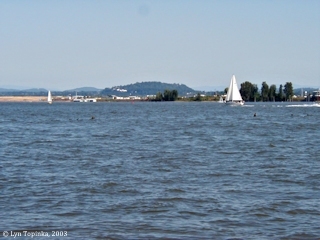 Downstream on the Oregon side is Tomahawk Island and Hayden Island. 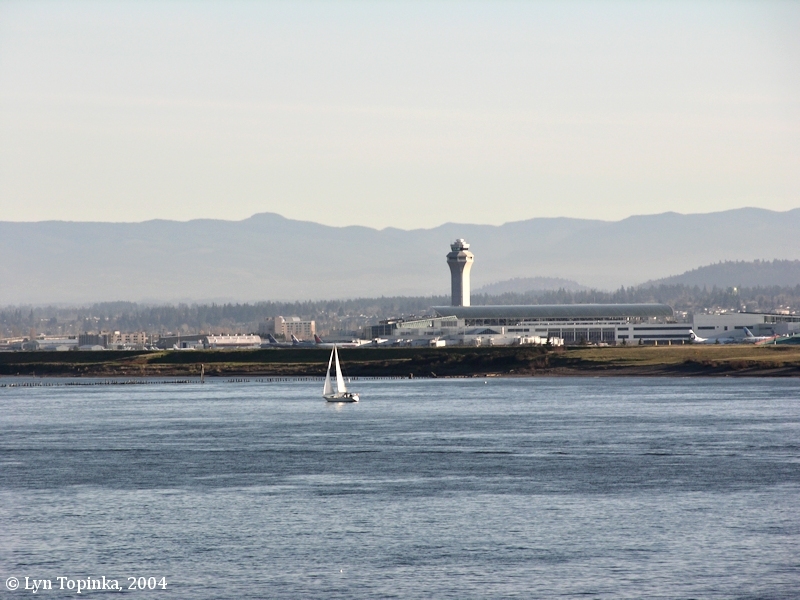 Click image to enlarge Portland International Airport, as seen from Ryan Point, Washington. Image taken December 18, 2004. 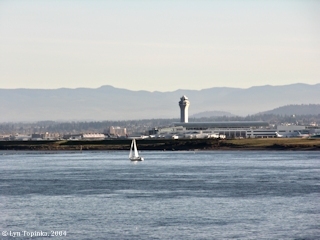 Click image to enlarge Portland International Airport, as seen from Ryan Point, Washington. Image taken June 15, 2003. 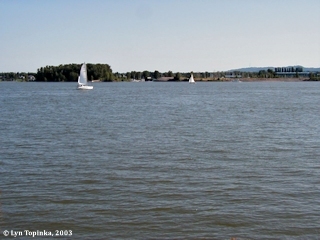 Click image to enlarge Rocky Butte, Oregon, as seen from Ryan Point, Washington. Rocky Butte is one of the volcanic cones of the Boring Lava Field which covers quite a bit of Portland's eastern outskirts. Image taken June 15, 2003. Click image to enlarge Tomahawk Island, Oregon as seen from Ryan Point, Washington. Image taken June 15, 2003. Click image to enlarge View from Ryan Point, Washington, with Mount Hood. Wave action from a passing boat. Image taken December 18, 2004. Click image to enlarge View from Ryan Point, Washington. Wave action from a passing boat. Image taken December 18, 2004.